There are so many exciting things taking place this month,one of which being the month of Black History. This is a great time to question things (though in truth, the following should be done every day), and reflect on important truths. It’s a time to be deeply introspective, and educate ourselves further on one of the most important discussions we can have.— slavery. A touchy subject? Yes. Touchy, but so very crucial. Visible minorities, black slavery, politics, reflection of self and our collective past as human beings etc. are all very important things to consider as we enter this important time of year. I want to kick this off by saying that we are all equals regardless of the color of our skin and our heritages and cultural differences, and that is one thing that I will stand by until the end. Nobody deserves to be oppressed or mistreated. 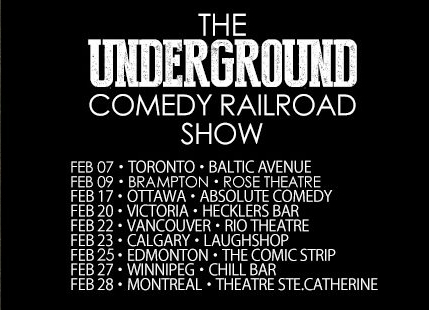 The Underground Comedy Railroad is doing a cross-Canada 9 city tour and will reach Toronto, Brampton, Ottawa, Victoria, Vancouver, Calgary, Edmonton, Winnipeg, and last but definitely not least Montreal. This amazing show concept is a way of commemorating the freedom of black slaves and bringing a voice to the people, just as the original Underground Railroad gave freedom and opportunity to the oppressed African Americans many years ago. The Underground Comedy Railroad Canadian tour will introduce the voice of black Canadians who have limited access to the mainstream media, to our fellow citizens in each city. During Black History Month, the tour’s objective is to give the center stage and spotlight to one of the countries smallest visible minorities and bring people together in unity, as well as recognizing that slavery is a very real thing and not to be taken lightly, but still maintain a humorous undertone at the same time. 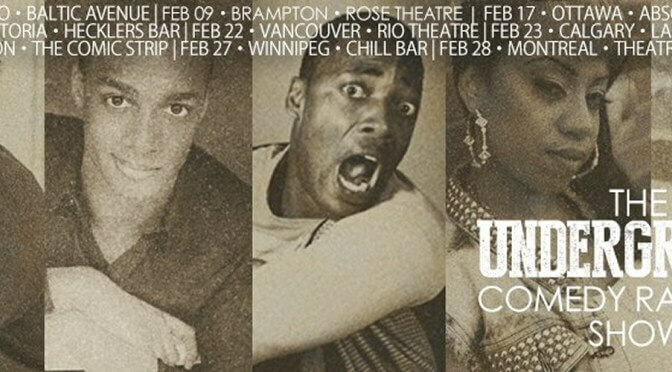 The Underground Railroad Comedy Show is Canada’s first all black Canadian comedy tour featuring hilarious comedians Rodney Ramsey, Daniel Woodrow, Andrew Searles. It takes place Friday February 7th 2014 from 10:00 pm to 11:30 pm. This February 2014 we re-welcome the 3rd annual Underground Comedy Railroad! The tours lineup consists of steadfast and accomplished Canadian comedians who are truly outstanding homegrown celebrities in their own right. These outstanding individuals communicate a remarkable perspective that is uniquely Canadian. The show will kick off in Toronto on Friday February 7th on Baltic Avenue (875 Bloor St. West Toronto, Ontario) Tickets are $20 or if you purchase in advance online, $15. For more information about the line-ups and dates you can check out the official website here.